The purpose of this report ‘The Ocean and Climate Change – Tools and Guidelines for Action’ is to engage, inform and guide decision makers with regard to the development and implementation of marine and coastal climate change strategies and programmes.Despite its enormous importance in regulating global climate and its sensitivity to the impacts of climate change and ocean acidification, the ocean continues to get only peripheral attention in global climate research, climate change policy and implementation plans. For example, recent authoritative coverage of climate change in a Nature special issue made little reference to the ocean and no reference to marine biodiversity. 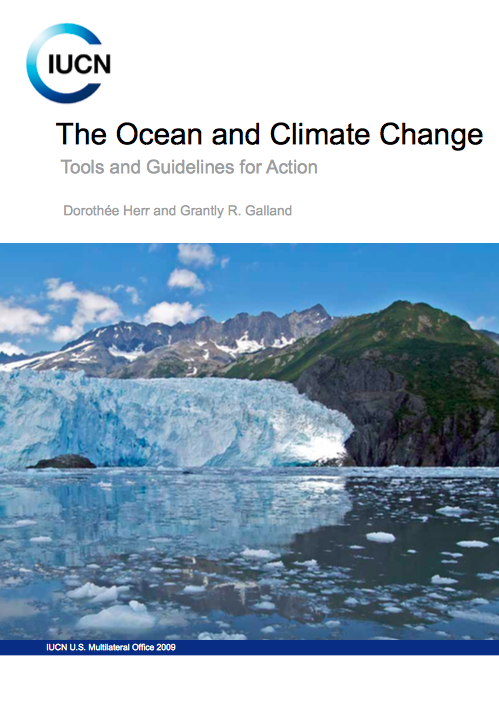 This document on ‘The Ocean and Climate Change – Tools and Guidelines for Action’ serves to raise awareness and gives science-based action recommendations relevant to international and national climate change implementation processes. The document provides an overview of the interactions between the ocean and climate and describes the impacts of climate change on the marine ecosystems and the goods and services they provide human society. Further, it outlines a set of recommendations for marine-related mitigation and adaptation policy and implementation actions. The potential and limits of the ocean in climate change mitigation strategies is highlighted by sections on marine renewable energy resources, natural marine carbon sequestration, carbon capture and storage and ocean fertilization. The publication further stresses Ecosystem-based Adaptation (EbA) as a means to improve social and ecosystem resilience to global ocean and climate change. Carefully designed marine protected areas and risk reduction management are included as means to reduce vulnerability of social and natural systems to future change.